KATIE: PINK, Waffles. Pink. You should know by now we're all about pink. KATIE: Pink, white and orange? That's never going to work, Waffles. KATIE: Ok first, the graphics are already done and they're pink. Pink, white and blue. Not pink, white and orange. WAFFLES: I can fix that Boss! KATIE: And second, nothing rhymes with orange. You can't have a theme song that doesn't rhyme. Truer than the pink, white and blue-ooooh-ooooh-oooh. WAFFLES: I can rhyme, Boss. Truer than the pink, white and or-or-or-orange! That's me uh... That's me and Björn! OLGA: Björn??? Seriously? Do I really look like a Björn? Not only is the orange cat a really bad rhymer, he can't even tell the difference between boycats and girlcats. I hear he wears wigs too. Must not be right in the head. WAFFLES: Right in what head? 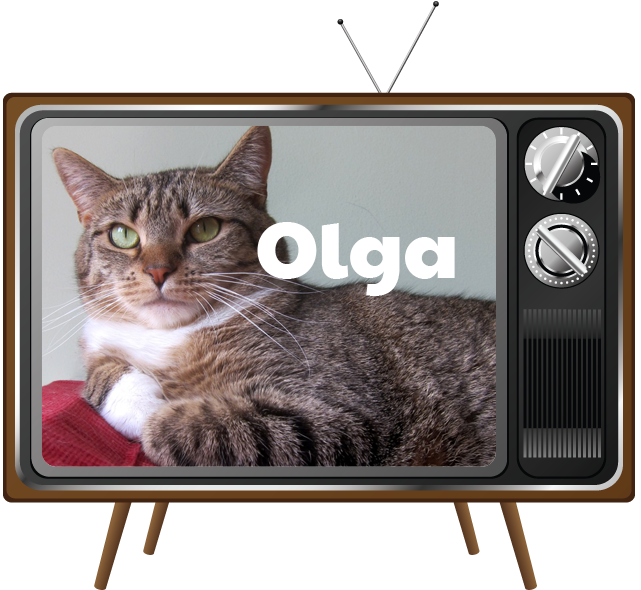 Today's Cameo Cat is Olga. She’s about two years old and as beautiful as can be. Can you believe this pretty girl has been at the shelter for over a year? That makes our heart sad. 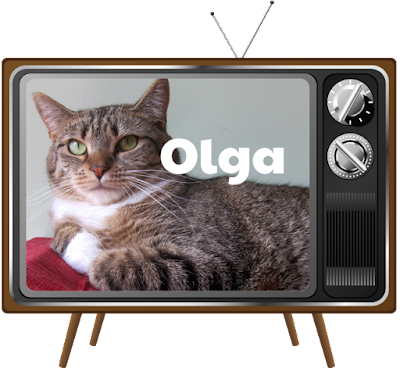 Olga is mild mannered and shy but can easily be coaxed to come out and play. She gets along well with other cats. Sometimes the shy cats are overlooked for the more comfortable and outgoing cats. We like to always remember though that being in a shelter is just not a natural thing. It can be scary and stressful. So don't forget to give those shy girls and boys a chance. Katie is as shy as any cat we know... and we love her to pieces. Olga is available for adoption at PAWS, Pet Animal Welfare Society in Norwalk, Connecticut. 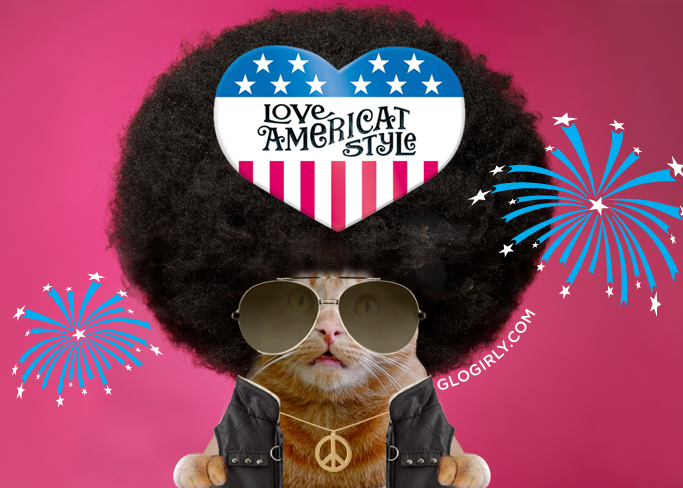 Have a Safe, Happy & Groovy 4th of July! I just love you guys !! Your pawsome !! 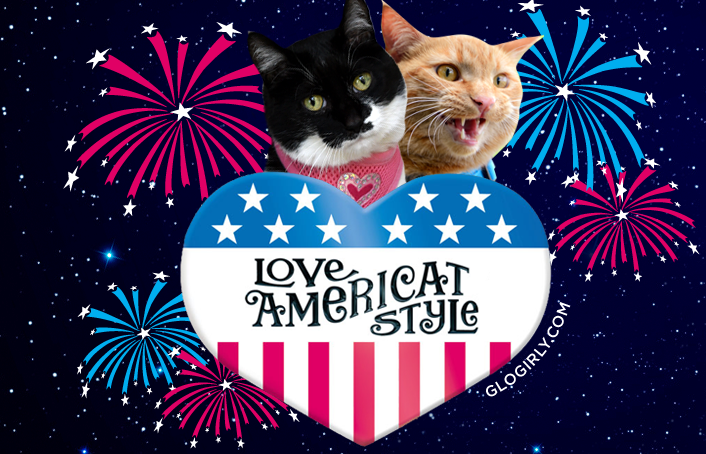 Have a Happy 4th of July Katie ,Waffles , Glogirl and Glowman . My human has something that rhymes with orange - DOOR HINGE! And didn't Denny's restaurants used to be pink and orange or something like that? Let's hope Olga can declare her independence from the animal shelter soon. Waffles is groovy in that wig. Happy Fourth! 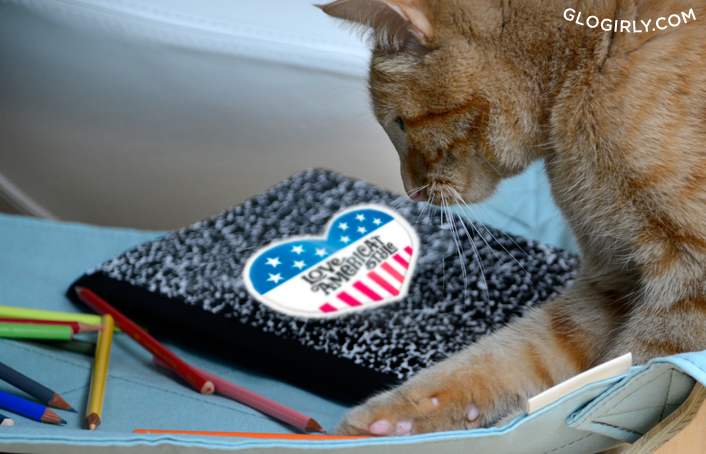 And thank you for helping PAWS cats. Olga is pretty, I hope she gets her forever home soon. Happy 4th! Olga is a beauty for sure. Mommy remembers that TV show! She used to watch it all the time. 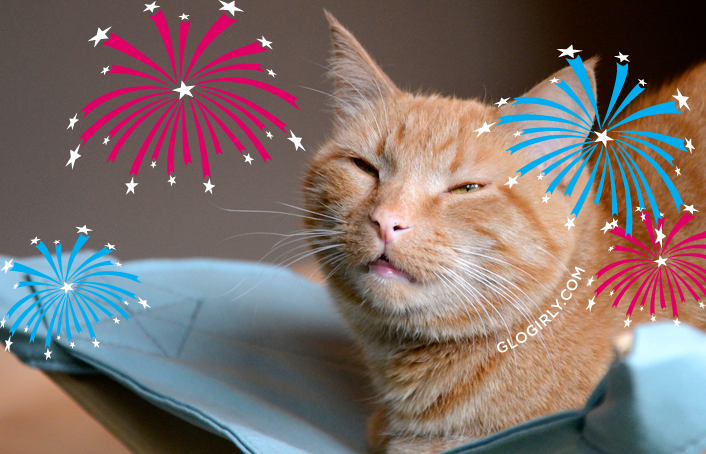 Oh Waffles, we love your Orange photos with the fireworks! And as always we love your big hair! We love Olga -- she is so, so sweet and gentle. Thank you for featuring her! Olga is sure a precious girl! 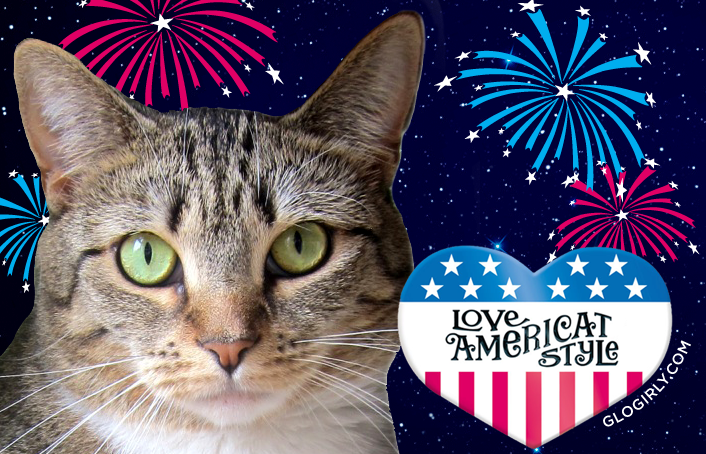 Happy LOVE AMERICAN STYLE 4TH! What a pretty little lady you are Olga..Best wishes to you..Happy 4th to everyone..love the Afro Waffles..
Olga is beautiful, Katie, and you, Waffles and Glogirly are doing something so wonderful, bringing attention to these kitties in need. Paws up to you! Wishing all of you a safe and happy 4th! he he - you go Olga. he he Waffles is cute, but a little dense sometimes. He's still trying to become a mancat and has a lot to learn yet. Hope you find your forever home soon. Very cute as always katie and Waffles. Weez sharin' dat bootyful Olga and purrayin' she gets a home soon. Cute, cute, cute!!! Happy 4th! Happy 4th of July to all of you! Olga is pretty. I hope she gets her home very soon. Happy 4th of July!!!! We think Katie is right. Olga looks like a sweetie. Sending paw prayers she finds her furever home soon!!! We purr that Olga finds her home soon...she's so sweet. Happy 4th of July to you! Whoa! Hey Waff, I think you struck out with Olga. You may need to make up with some bling or flowers.